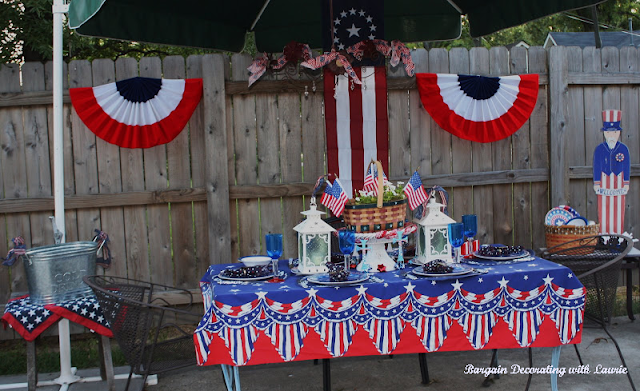 I'm re-sharing some of my previous Independence Day tablescapes and parties. You can click on the date or the photo to get details about any of these tables. This table served snacks in 2015. I created a drum theme on this 2014 dinner table. Another table in 2014 featured a yellow, white, and blue theme for the 4th of July. Until I started recapping previous tables I didn't realize that in 2014, we did a lot of celebrating of Independence Day. This was a snack area for a swimming party for our grandchildren and their friends. A 2013 4th of July, our celebration involved plastic baskets with red checked liners. The table was set for munching on the 4th in 2013. A 4th of July dinner in 2011. In 2010, I added cherries to our patriotic outdoor tablescape. We also had an outdoor dinner celebration in 2009. That's a lot of red, white, and blue one post -- not to mention my substitution of yellow for the red on one table. I'm glad you stopped by, and I hope you're not "seeing red" after this post. Beautiful tables, all of them! Thanks for the recap. I love them all. You are truly a kindred spirit when it comes to decorating for every holiday. And I love the way you switch things up from year to year. Thanks for giving me so many ideas! Your tables show such variety and creativity. My favorites are the ones where you used the patriotic tablecloths. That's a nice table setting. I remember many of these Laurie! Wishing you a fun 4th! Those are some great ideas. I especially like the quilted topper you used at your party and in the tablescape. Happy 4th!